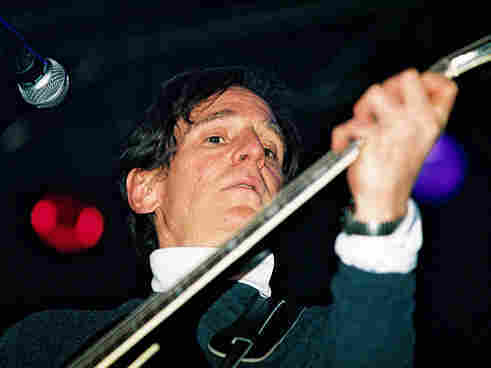 The Late Alex Chilton, An Uncompromising Rocker The influential musician and producer, of The Box Tops and Big Star fame, died this week after a sudden heart attack at age 59. Neda Ulaby looks back on Chilton's varied career. Bob Boilen Attends The Big Star Memorial Show At SXSW 2010. Alex Chilton was not well-known. But he was worshiped by a generation of rock stars, including REM, Wilco and The Replacements, who wrote an entire song about him. He died Wednesday afternoon of an apparent heart attack while mowing his lawn in New Orleans. He was 59 years old. Rock snobs describe Chilton as one of modern music's great underappreciated figures. Some say he helped invent power pop. But a few years ago, Chilton told WHYY's Fresh Air he had no idea what power-pop even meant: "I dunno really, you know? I like simple pop songs with no real message, you know? Just about feeling good and being happy." The music Chilton made with the band Big Star has been called The Beatles turned upside down. He seemed to wrest the sound of rootsy Americana back through the filter imposed on it by British art school dropouts a decade earlier. Chilton was only 16 when his recording career began in a white-hot blaze with "The Letter," his 1967 No. 1 hit with the Box Tops. Chilton sounded like Memphis — the city where he grew up. But he said producers coached him through every growling note and, listening back to the song, he could only hear them. For the rest of his career, Chilton made a point of pleasing himself. Chilton was happiest making the kind of music he considered uncompromised. He produced the first record by the iconic punk band The Cramps: "There was a sort of anarchistic edge to it, and it wasn't some corporate showcase of 'Stepford wives' bands, you know?" But it was the rock Chilton made with the band Big Star that may most define his legacy. Though Big Star only made three albums, the story of Big Star is a sad part of music industry mythology. The band never had a hit, one of its members died in a car crash after they broke up, and their records were hard to find — which may have contributed to the cult that grew around them. Ken Stringfellow followed the power-pop path a generation later with The Posies, a band that has performed as part of a reconstituted Big Star for the past 15 years. They were supposed to play at the South By Southwest music festival on Saturday. "I'm definitely still in shock," Stringfellow says. He also says that, in spite of Big Star's reputation among indie musicians, Chilton felt ambivalent about the band: "He felt the same way about Big Star when the band was together as he did later — that it was an experiment that didn't particularly work, and he moved on to other things." Things like baroque music. Stringfellow says Chilton loved transcribing it for Big Star and then making them play it: "That was one of the exercises he really enjoyed." His was an esoteric, idiosyncratic and often maddening career. But it was the one that Chilton wanted: "It seems to me that the world is full of great musicians who don't have any record companies interested in them. I'm not really so concerned about it. I've sort of got my scene going and have carved out a little niche, however little it is, in the music business, and I manage to play as many gigs as I want each year. I make money doing that, and make a little money here and there making records, and it's OK with me."